"...morality is distributed in our technological world in a way that makes some scientific problems particularly relevant to ethics. [...] One solution, I believe, is to re-examine the respect we have developed for particular externalities and then use those things as a vehicle to return value to people." Lorenzo Magnani, philosopher and cognitive scientist, is a full professor at the University of Pavia, Italy, and the director of its Computational Philosophy Laboratory. L. Magnani, The Abductive Structure of Scientific Creativity. An Essay on the Ecology of Cognition, Springer, Heidelberg/Berlin, 2017. This book employs a new eco-cognitive model of abduction to underline the distributed and embodied nature of scientific cognition. Its main focus is on the knowledge-enhancing virtues of abduction and on the productive role of scientific models. What are the distinctive features that define the kind of knowledge produced by science? To provide an answer to this question, the book first addresses the ideas of Aristotle, who stressed the essential inferential and distributed role of external cognitive tools and epistemic mediators in abductive cognition. This is analyzed in depth from both a naturalized logic and an ecology of cognition perspective. It is shown how the maximization of cognition, and of abducibility – two typical goals of science – are related to a number of fundamental aspects: the optimization of the eco-cognitive situatedness; the maximization of changeability for both the input and the output of the inferences involved; a high degree of information-sensitiveness; and the need to record the “past life” of abductive inferential practices. Lastly, the book explains how some impoverished epistemological niches – the result of a growing epistemic irresponsibility associated with the commodification and commercialization of science – are now seriously jeopardizing the flourishing development of human creative abduction. L. Magnani and T. Bertolotti (Eds. ), Springer Handbook of Model-Based Science, Springer, 2017. 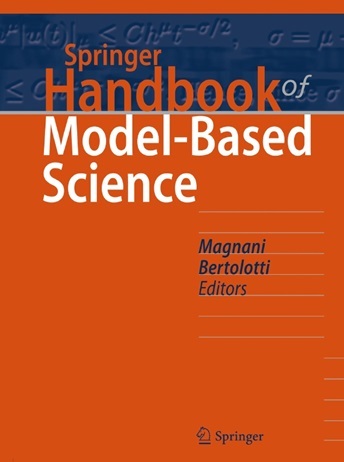 The Springer Handbook of Model-Based Science offers the first comprehensive reference guide to the interdisciplinary field of model-based reasoning. It highlights the role of models as mediators between theory and experimentation, and as educational devices, as well as their relevance in testing hypotheses and explanatory functions. The Springer Handbook merges philosophical, cognitive and epistemological perspectives on models with the more practical needs related to the application of this tool across various disciplines and practices. The result is a unique, reliable source of information that guides readers toward an understanding of different aspects of model-based science, such as the theoretical and cognitive nature of models, as well as their practical and logical aspects. The inferential role of models in hypothetical reasoning, abduction and creativity once they are constructed, adopted, and manipulated for different scientific and technological purposes is also discussed. Written by a group of internationally renowned experts in philosophy, the history of science, general epistemology, mathematics, cognitive and computer science, physics and life sciences, as well as engineering, architecture, and economics, this Handbook uses numerous diagrams, schemes and other visual representations to promote a better understanding of the concepts. This also makes it highly accessible to an audience of scholars and students with different scientific backgrounds. All in all, the Springer Handbook of Model-Based Science represents the definitive application-oriented reference guide to the interdisciplinary field of model-based reasoning. 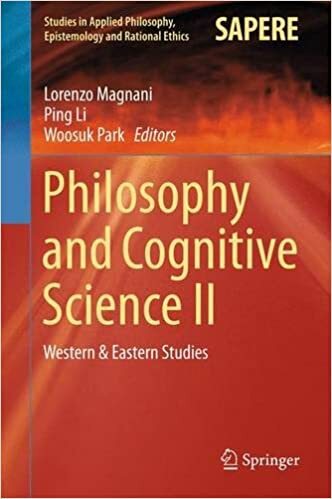 Lorenzo Magnani, Ping Li, Woosuk Park (Eds. ), Philosophy and Cognitive Science. Western and Eastern Studies. L. Magnani (ed. ), Model-Based Reasoning in Science and Technology, Theoretical and Cognitive Issues: Studies in Applied Philosophy, Epistemology and Rational Ethics, Vol. 8. Understanding Violence. The Intertwining of Morality, Religion and Violence: A Philosophical Stance. Series: Studies in Applied Philosophy, Epistemology and Rational Ethics, Vol. 1.This volume sets out to give a philosophical “applied” account of violence, engaging with both empirical and theoretical debates in other disciplines such as cognitive science, sociology, psychiatry, anthropology, political theory, evolutionary biology, and theology. The book’s primary thesis is that violence, also understood as violence beyond the domain of physical harm, is inescapably intertwined with morality and typically enacted for “moral” reasons. To show this, the book compellingly demonstrates how morality operates to trigger and justify violence and how people, in their violent behaviors, can engage and disengage with discrete moralities. By employing concepts such as “coalition enforcement”, “moral bubbles”, “cognitive niches”, “overmoralization”, “military intelligence” and so on, the book aims to spell out how perpetrators and victims of violence systematically disagree about the very nature of violence. The author’s original claim is that disagreement can be understood naturalistically, described by an account of morality also informed by evolutionary perspectives. Go to Springer websiteItalian Edition, translated by T. Bertolotti, Filosofia della violenza, Il Melangolo, Genoa, 2012. Studies in Applied Philosophy, Epistemology and Rational Ethics (SAPERE) publish new developments and advances in all the fields of philosophy, epistemology, and ethics, bringing them together with a cluster of scientific disciplines and technological outcomes: ranging from computer science to life sciences, from economics, law, and education to engineering, logic, and mathematics, from medicine to physics, human sciences, and politics. The series aims at covering all the challenging philosophical and ethical themes of contemporary society, making them appropriately applicable to contemporary theoretical and practical problems, impasses, controversies, and conflicts. The volume is based on the papers that were presented at the international conference Model-Based Reasoning in Science and Technology (MBR09_BRAZIL), held at the University of Campinas (UNICAMP), Campinas, Brazil, December 2009. The presentations given at the conference explored how scientific cognition, but several other kinds as well, use models, abduction, and explanatory reasoning to produce important or creative changes in theories and concepts. Some speakers addressed the problem of model-based reasoning in technology, and stressed the issue of science and technological innovation. The various contributions of the book are written by interdisciplinary researchers who are active in the area of creative reasoning in logic, science, and technology: the most recent results and achievements about the topics above are illustrated in detail in the papers. The book is divided in three parts, which cover the following main areas: part I, abduction, problem solving, and practical reasoning; part II: formal and computational aspects of model based reasoning; part III, models, mental models, representations. Abductive Cognition. The Epistemological and Eco-Cognitive Dimensions of Hypothetical Reasoning (Springer, in press) explores abductive cognition, an important but, at least until the third quarter of the last century, neglected topic in cognition. It integrates and further develops ideas already introduced in a previous book, which I published in 2001 (Abduction, Reason, and Science. Processes of Discovery and Explanation, Kluwer Academic/Plenum Publishers, New York). The status of abduction is very controversial. When dealing with abductive reasoning misinterpretations and equivocations are common. What are the differences between abduction and induction? What are the differences between abduction and the well-known hypothetico-deductive method? What did Peirce mean when he considered abduction both a kind of inference and a kind of instinct or when he considered perception a kind of abduction? Does abduction involve only the generation of hypotheses or their evaluation too? Are the criteria for the best explanation in abductive reasoning epistemic, or pragmatic, or both? Does abduction preserve ignorance or extend truth or both? How many kinds of abduction are there? Is abduction merely a kind of “explanatory” inference or does it involve other non-explanatory ways of guessing hypotheses? The book aims at increasing knowledge about creative and expert inferences. The study of these high-level methods of abductive reasoning is situated at the crossroads of philosophy, logic, epistemology, artificial intelligence, neuroscience, cognitive psychology, animal cognition and evolutionary theories; that is, at the heart of cognitive science. My book Morality in a Technological World. Knowledge as Duty (Cambridge University Press) is now available on Amazon and other leading bookstores. In the eighteenth century, Immanuel Kant held that we should regard other human beings as ends in themselves, never as mere means. In Knowledge as a Duty, however, Lorenzo Magnani contends that one of the best hopes for achieving social justice is to do exactly what Kant warned against: we must treat people as if they were things. By acknowledging the “thingness” of human beings, Magnani argues, we can learn to value people in important new ways and extend to them the kind of worth we have lavished on certain non-human entities. This shift in perspective, however, requires a great deal of new ethical knowledge as well as modern approaches to moral deliberation, and to achieve these goals Magnani provides compelling analyses of such problems and offers a variety of strategies we might use to solve them. Viewing human beings through an updated moral framework is especially important given the profound changes that have occurred since Kant’s time, for modern technologies have brought about consequences of such magnitude that old policies and ethics can no longer contain them. 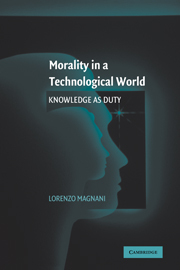 Magnani believes that producing and applying recalibrated moral knowledge has become a duty, one that is just as important as making scientific or medical advances. Among the troubling issues he addresses here are cyberprivacy, globalization, bad faith, cloning, biotechnologies, and ecological imbalances; the right knowledge, Magnani maintains, can manage these challenges and counter many of technology’s ill effects by preserving ownership of our own destinies, encouraging responsibility, and enhancing freedom. Also discussed are how objects, structures, and technological artifacts serve as moral carriers and mediators; the problem of free will; and the nature of practical reasoning. Using an entirely new methodology that blends epistemology with cognitive science, Magnani seeks to overthrow some traditional philosophical perspectives that have become obsolete in today’s technological era. Italian Edition of the first two Chapters: Rispetta gli altri come cose, Il Melangolo, Genoa, 2013. The Proceedings of the International Conference MBR06_CHINA, edited by L. Magnani and P. Li, is now available online on Springer.com, and on Amazon.com and other international bookstores. The volume is based on the papers that were presented at the international conference Model-Based Reasoning in Science and Medicine (MBR’06 China), held at Sun Yat-sen University, Guangzhou, P.R. China in July 2006. The presentations given at the conference explored how scientific thinking uses models and explanatory reasoning to produce creative changes in theories and concepts. Some addressed the problem of model-based reasoning in technology, and stressed the issue of technological innovation and medical reasoning. The various contributions of the book are written by interdisciplinary researchers who are active in the area of creative reasoning in science and technology: the most recent results and achievements about the topics above are illustrated in detail in the papers. [意] 洛伦佐·玛格纳尼 / 著；李大超，任远 / 译，《溯因、理由与科学——发现和解释的过程》，中国广州：广东人民出版社2006年. Translated by Dachao Li and Yuan Ren, Guangdong People’s Publishing House, Guangzhou, 2006).